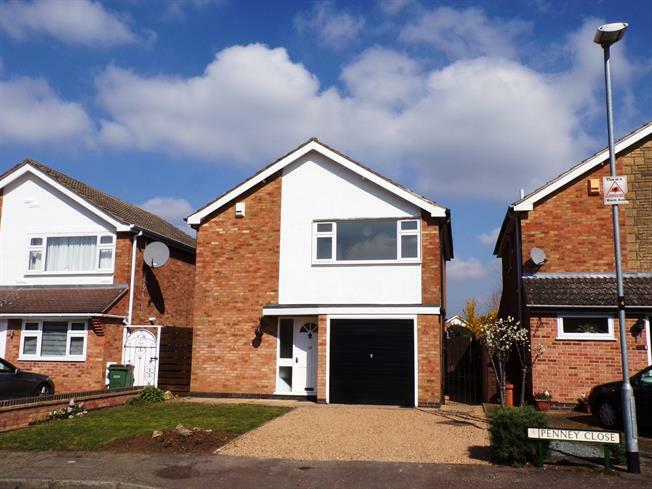 3 Bedroom Detached House For Sale in Wigston for Offers in the region of £270,000. Located in the heart of Wigston, rarely available is an immaculately presented detached family home. Providing good living space and a fantastic garden. Entrance hall leading to a spacious living room with French doors opening onto the patio, archway to the kitchen, to the first floor are three well proportioned bedrooms and a modern refitted bathroom. Enclosed rear gardens, gravelled driveway and single garage. Wooden single glazed door, opening onto the driveway. Single glazed wood window with patterned glass. Radiator, under stair storage. UPVC French double glazed door, opening onto the patio. Double aspect double glazed uPVC windows facing the rear and side. Radiator and electric fire. Double glazed uPVC window facing the rear overlooking the garden. Radiator, tiled flooring. Roll top work surface, wall and base units, stainless steel sink, integrated oven, gas hob, overhead extractor. Having upvc obscure glazed window to the side elevation, airing cupboard and further storage cupboard. Double glazed uPVC window with obscure glass facing the side. Heated towel rail, tiled flooring. Low level WC, panelled bath, shower over bath, wash hand basin. To the front of the property is a gravelled driveway providing parking for several vehicles, small lawn with low brick wall. Side gated access leading to the rear garden which is private and enclosed by timber fencing. A full width paved patio area, steps up to a generous lawn with deep borders.